Jade Silk's dark blue weighted blanket offers an elegant, yet simple method of stress and tension relief for the household. Used while laying down, sleeping or sitting upright, this weighted blanket provides 10 lbs of evenly distributed weight for the user. Made for adults, the natural weight of the blanket assists with stress and anxiety relief, sleeping and sensory disorders, ADD, ADHD, and other mild disorders by providing a calming weight. 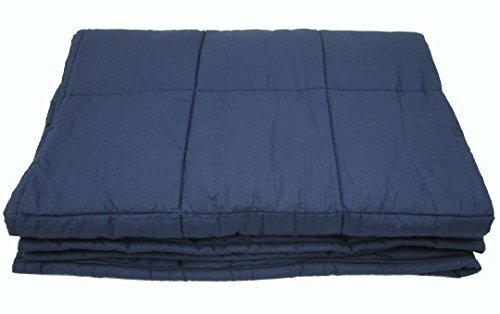 Weighted blankets are a unique, natural, and safe way to relax and calm the body. This blanket's shell is 100% cotton, the filler providing the weight are non-toxic poly pellets. Comfortable and soft, 10 lb weighted blanket for adults with easy to clean cotton fabric. Elegant and simple style. Weighted blankets offer users a relaxing effect by providing a neutral weight across the body while sleeping or laying down. Great for a good night's sleep. Weighted blankets help with stress and anxiety relief, sleeping and sensory disorders, ADD, ADHD, and mental stress. Measures 41" x 60". Hand wash or delicate cycle and dry flat. Easy to spot clean. If you have any questions about this product by Jade Silk, contact us by completing and submitting the form below. If you are looking for a specif part number, please include it with your message.